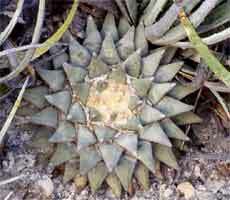 A. retusus LRM262, a typical specimen. A. retusus LRM262 showing the somewhat linear areoles of this population. This is a long smooth tubercled form of A. retusus, quite different to the 'scapharostroides' form found a few kilometres to the south, and the 'furfuraceus' type plants to the north at Pressa de Guadalupe. A notable feature of these plants is the very linear areole on the tubercle tip. 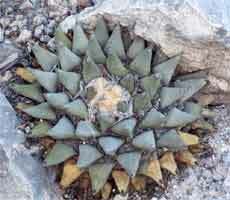 The plants grow on low but quite steep limestone slopes with low bushes and are accompanied by Astrophytum myriostigma.